Event will be limited to the first 20 WoMAN members who register. All levels, including new players, welcome! This is a chance to meet other members and have some fun outdoors while improving your skill a bit. Please indicate on the registration form if you do not have clubs. Appropriate attire (no jeans or flip flops) required. 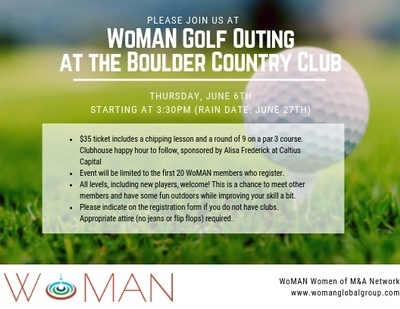 $35 ticket includes a chipping lesson and a round of 9 on a par 3 course. Clubhouse happy hour to follow, sponsored by Alisa Frederick at Caltius Capital.